We want to inspire, foster and develop a life-long love of healthy activity and sports in all Kiwi kids. To do this, we help them realise their sporting potential and associate exercise with fun by identifying their natural talents in an entertaining environment through our world-renowned scientific methodology. We then act as an entry point for kids to gain easy access to local sporting communities and recognise raw elite talent that would benefit from a high-performance program. We believe our method results in children sticking to a healthy pathway for longer and lays the foundation for a better lifestyle through their teen years and beyond. Our methodology was devised with the help of international experts in the field of sport optimisation and improvement, and is focused on the main areas of strength, endurance, speed, coordination, flexibility and their combination. The entire event is fun, entertaining, and focused on creating a pleasant and memorable experience for your child. We begin with group warmup activities, then assign each child by age to a small team led by our coaches who take them through a series of fun tests to reveal their somatotype, sport dispositions and strengths by assessing their coordination, speed, power, endurance and tactical skills. We then make an individual assessment for each child and compare it with multiple sports requirements. 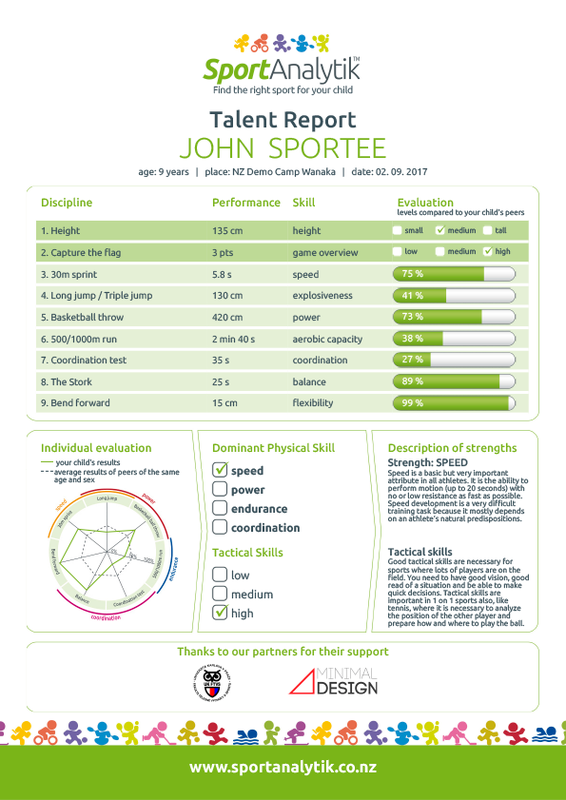 As a result, we identify their sporting talent and provide them with a tailor-made report. This includes recommendations for their most suitable sports (including sports teams and clubs in the surrounding areas) and identifies natural elite talent to be nurtured into elite sport pathways. Our program is designed for children aged five to sixteen. As well as a half-day of fun activities, healthy snacks and hearty high fives, they will receive individual talent and sport reports. 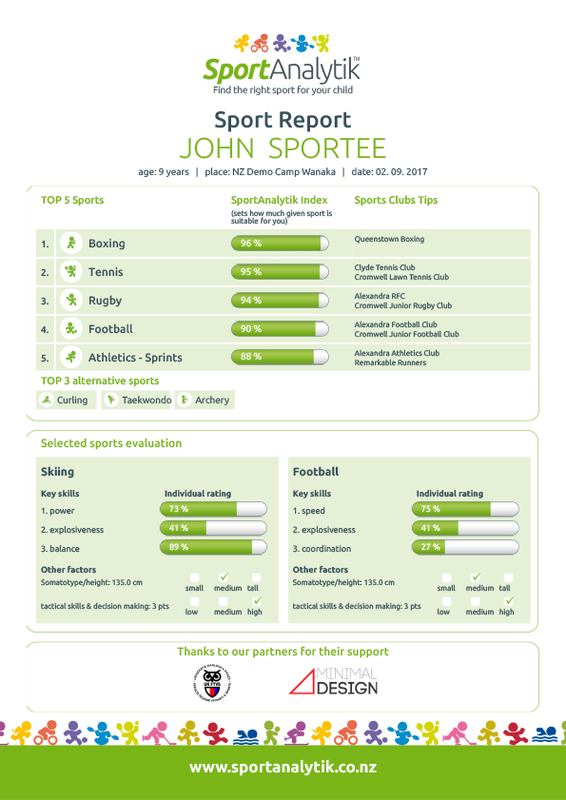 The reports summarise your child’s results, provide age and gender specific peer comparison leveraging a database of over 400,000 children, and offers recommendations for eight suitable sports for your child. A more in-depth evaluation of two parent-selected sports is also provided. The aim of SportAnalytik is to get ALL children to fall in love with sports. We do this by assessing their physical skills in a really fun environment. We want them to associate being active with being happy, that is what is really important to us. doc. PaedDr. Tomas Peric, Ph.D. Department Head, author of "Selection of sport talents"
"I have pursued the area of sport talent selection for 25 years and SportAnalytik is a neat project for the general public, that leverages talent identification methodology derived using the scientific method"